Our experienced technicians provide the electrical know how to install your new transfer switch the right way the first time. Under the new state law, most gas stations in the long island region that are one half mile of highway exits of near hurricane evacuation routes are mandated to have a transfer switch installed by April 1, 2014, and deploy and install a generator within 24 hours of losing utility power. 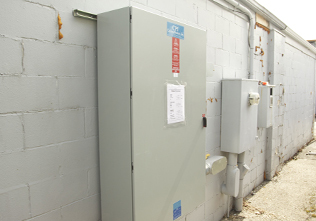 Chains of gas stations are required to have a working transfer switch installed at an additional 30% of their stations under the same criteria by August 1, 2015. NYSERDA, the main supporter of this initiative, will be providing up to $10,000 - $13,000 per station to assist with these upgrades. What is the Gas Station Back-Up Power Program?? The Gas Station Back-Up Power Program ensures the continued availability of fuel to New Yorkers in the downstate area during an energy or fuel supply emergency. Developed as a direct response to Superstorm Sandy, when many gas stations in the areas affected by the storm had gasoline but did not have electricity to run the pumps, this program helps pay for wiring necessary to accept portable emergency generators and for installation of permanent back-up generators. The program, which is the strongest in the nation, should provide first responders, essential personnel, evacuating residents and other motorists with peace-of-mind knowing that gas stations have the necessary back-up power capacity to dispense gasoline and get things back to normal as quickly as possible after an energy or fuel supply emergency has been declared.